Because I've been on a 10mm binge lately, I thought It would be cool to write some of the shops that sell this scale. This will be a continued work in progress for obvious reasons. Pendraken (UK) - 100% devoted to 10mm, massive selection of great minis, both historical as well as fantasy. Magister Millitum (UK) - Historicals and fantasy alike, pretty reasonable price and quality. Kallistra (UK) - Same miniatures sold by Pendraken but, from what I read, on the bigger side, they are also sold in strips instead of individual minis. Copplestone Castings (UK) - Heavily inspired Middle Earthy, Mark Copplestone brought us, a fantastic, albeit limited, range with a tons of detail. Sold through Northstar Figures. Old Glory (US) - Historical miniatures, with some being easily used as fantasy miniatures. Also available in the UK at OldGloryUk. 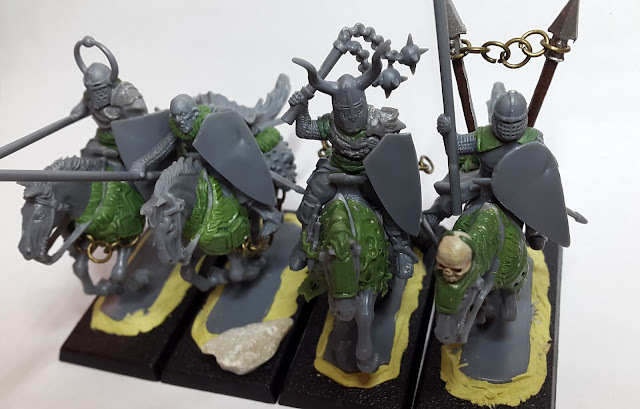 Eureka Miniatures (AU) - Mostly focused on recreating Warhammer armies that didn't had a Warmaster oficial release, fantastic detail and also available in the UK at Fighting 15s. Rebel Minis (Mighty Armies range) (US) - Ocs and Wood Elf, sold as a ready made army. Polar Fox Miniatures (RU) - Source of, fantastically sculpted, Warhammer themed Orcs & Goblins and Tomb Kings. Warmonger Miniatures (US) - Small, but solid, Landsknechte range. Trolls Under the Bridge (CZ) - Chaos warriors and chaos heroes. 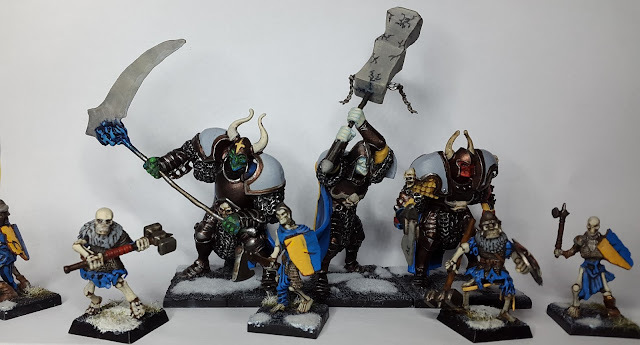 Vanguard Miniatures (UK) - Warhammer inspirired Ogre Warriors. Bestial Wars (US) - Very colorful wood elfs, treeants and abominations. Warrior Miniatures (UK) - Small range of incredibly cheap but low detail historicals and fantasy miniatures. Irregular Miniatures (UK) - Cheap with varying degrees of quality, good historicals. Castle Arts (IT) - Pretty vast range of samurais and other Japanese related minis. TB Line (IT) -Nice and solid range of medieval miniatures. Now sold by Pendraken. New Line Designs (UK) - Good range of historical ancients. ObeliskMiniatures (DE)- Small range of Conquistadores and Incas. Hinds Figures (UK) - Small medieval range, no images whatsoever. Spellcrow (PL) - Expertly sculpted barbarians, lizardmen and dwarfs. Games Workshop (UK) - Their warmaster line had amazing detail and can still be found on ebay. Game Figures, Inc. (US) - Used to produce the Minifig range, with a lot of fantasy miniatures, they also owned the A.I.M. range, filled with good quality samurai. Division After Division seems to be the new owners of the A.I.M. range but I couldn't find anything on them. Tajima1 (UK) - A tiny range of chaos warriors that looked really good. While a lot of 10mm manufacturers produce large infantry, you may find that 15mm manufacturers match the use and are usually cheaper. They are also a good source of monsters. Ralpartha Europe (UK) - Great quality Warhammer inspired sculpts on their Demonworld range, use the monsters and spirits. 15mm.co.uk (UK) - Classic fantasy sculpts with really nice monsters. Khurasan Miniatures (US) - In my opinion, one of the best 15mm out there, not only in quality but also variety.